↑ "DPR Korea 2008 Population Census National Report" (PDF). Pyongyang: DPRK Central Bureau of Statistics. 2009. สืบค้นเมื่อ 2011-02-19. ↑ "Country Profile: North Korea". Foreign and Commonwealth Office, UK. 2009-06-25. สืบค้นเมื่อ 2010-02-10. ↑ 4.0 4.1 "Korea, North". The World Factbook. 2009. สืบค้นเมื่อ 2010-05-17. ↑ Sanger, David E. (1991-05-29). "North Korea Reluctantly Seeks U.N. Seat". The New York Times Company. สืบค้นเมื่อ 2009-07-04. ↑ Spencer, Richard (2007-08-28). "North Korea power struggle looms". The Telegraph (online version of UK national newspaper). London. สืบค้นเมื่อ 2007-10-31. A power struggle to succeed Kim Jong-il as leader of North Korea's Stalinist dictatorship may be looming after his eldest son was reported to have returned from semi-voluntary exile. Parry, Richard Lloyd (2007-09-05). "North Korea's nuclear 'deal' leaves Japan feeling nervous". The Times (online version of UK's national newspaper of record). London. สืบค้นเมื่อ 2007-10-31. The US Government contradicted earlier North Korean claims that it had agreed to remove the Stalinist dictatorship’s designation as a terrorist state and to lift economic sanctions, as part of talks aimed at disarming Pyongyang of its nuclear weapons. Walsh, Lynn (2003-02-08). "The Korean crisis". CWI online: Socialism Today, February 2003 edition, journal of the Socialist Party, CWI England and Wales. socialistworld.net, website of the committee for a worker’s international. สืบค้นเมื่อ 2007-10-31. Kim Jong-il's regime needs economic concessions to avoid collapse, and just as crucially needs an end to the strategic siege imposed by the US since the end of the Korean war (1950–53). Pyongyang's nuclear brinkmanship, though potentially dangerous, is driven by fear rather than by militaristic ambition. The rotten Stalinist dictatorship faces the prospect of an implosion. Since the collapse of the Soviet Union, which deprived North Korea of vital economic support, the regime has consistently attempted to secure from the US a non-aggression pact, recognition of its sovereignty, and economic assistance. The US's equally consistent refusal to enter into direct negotiations with North Korea, effectively ruling out a peace treaty to formally close the 1950–53 Korean war, has encouraged the regime to resort to nuclear blackmail. ↑ 9.0 9.1 Brooke, James (2003-10-02). "North Korea Says It Is Using Plutonium to Make A-Bombs". The New York Times. สืบค้นเมื่อ 2007-10-31. North Korea, run by a Stalinist dictatorship for almost six decades, is largely closed to foreign reporters and it is impossible to independently check today's claims. ↑ 10.0 10.1 Buruma, Ian. "Leader Article: Let The Music Play On". The Times of India. สืบค้นเมื่อ 2008-03-27. 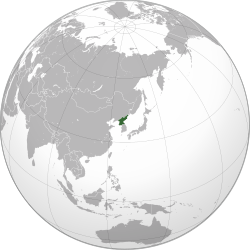 North Korea, officially known as the Democratic People's Republic of Korea, is one of the world's most oppressive, closed, and vicious dictatorships. It is perhaps the last living example of pure totalitarianism - control of the state over every aspect of human life. ↑ Finn, Peter (2009-06-08). "U.S. to Weigh Returning North Korea to Terror List". Washington Post. สืบค้นเมื่อ 2009-06-19. The Bush administration removed North Korea from the list of terrorist states last year as part of an unfulfilled commitment by the dictatorship to dismantle its nuclear weapons program. ↑ "Constitution of North Korea (1972)". 1972. สืบค้นเมื่อ 2009-05-07. ↑ Martin, Bradley K. (2004). Under the Loving Care of the Fatherly Leader: North Korea and the Kim Dynasty. New York, NY: Thomas Dunne Books. p. 111. ISBN 0-312-32322-0. Although it was in that 1955 speech that Kim gave full voice to his arguments for juche, he had been talking along similar lines as early as 1948. ↑ Lee, May (1998-08-19). "Famine may have killed 2 million in North Korea". CNN. Archived from the original on February 9, 2007. สืบค้นเมื่อ 2007-08-01. ↑ "North Korea’s Military Strategy"[ลิงก์เสีย], Parameters, US Army War College Quarterly, 2003. ↑ "Freedom in the World, 2006". Freedom House. สืบค้นเมื่อ 2007-02-13. Citizens of North Korea cannot change their government democratically. North Korea is a totalitarian dictatorship and one of the most restrictive countries in the world. ↑ "A portrait of North Korea's new rich". The Economist. 2008-05-29. สืบค้นเมื่อ 2009-06-18. EVERY developing country worth its salt has a bustling middle class that is transforming the country and thrilling the markets. So does Stalinist North Korea. ↑ "Human Rights in North Korea". hrw.org. Human Rights Watch. 2009-02-17. สืบค้นเมื่อ 2010-12-13. ↑ "DPRK FAQ". Korean Friendship Association. 2011-11-22. สืบค้นเมื่อ 2011-11-24. The DPRK is a single-united-party constitutional democracy guaranteeing freedom of speech and assembly to all citizens. DPRK citizens play an active role in their nation’s political life at the local, regional and national levels, through their trade unions or as members of one of the nation’s three political parties, which include the Workers’ Party of Korea, the Chondoist Chongu Party and the Korean Social Democratic Party. ↑ "Armed forces: Armied to the hilt". The Economist. 2011-07-19. สืบค้นเมื่อ 2011-07-28. ↑ Anthony H. Cordesman (2011-07-21). The Korean Military Balance (PDF). Center for Strategic & International Studies. ISBN 978-0-89206-632-2. สืบค้นเมื่อ 2011-07-28. The DPRK is one of the most militarized countries in the world. It has extraordinarily large anti-aircraft holdings, nearly twice the artillery strength of the ROK, as well as a major advantage in self-propelled artillery and a massive lead in multiple rocket launchers. ↑ Nash, Amy (2008). "Korean Americans - Overview, Early history, Modern era, The first koreans in america, Significant immigration waves". Multicultural America. Advameg Inc. สืบค้นเมื่อ 2009-07-04. ↑ "Culture of North Korea - Alternative name, History and ethnic relations". Countries and Their Cultures. Advameg Inc. สืบค้นเมื่อ 2009-07-04. ↑ "Buddhist Temple Being Restored in N. Korea". Los Angeles Times. October 2, 2005. ↑ "Religious Intelligence UK report". Religious Intelligence. Religious Intelligence. สืบค้นเมื่อ 2009-07-04. ↑ United States Commission on International Religious Freedom (2004-09-21). "Annual Report of the United States Commission on International Religious Freedom". Nautilus Institute. สืบค้นเมื่อ 2007-08-02. ↑ "N Korea stages Mass for Pope". BBC News. 2005-04-10. สืบค้นเมื่อ 2007-08-02. ↑ "North Korean Religion". Windows on Asia. สืบค้นเมื่อ 2007-08-02. ↑ "Open Doors International : WWL: Focus on the Top Ten". Open Doors International. Open Doors (International). สืบค้นเมื่อ 2009-07-04. ↑ "Korea Report 2002". Amnesty International. 2001. สืบค้นเมื่อ 2007-08-02. หน้านี้แก้ไขล่าสุดเมื่อวันที่ 18 เมษายน 2562 เวลา 15:43 น.